The Walton girls crowded the podium, showcased their depth and clocked a new state-record in the 200-yard freestyle relay (1:33.50) to score a 366-to-243 victory over four-time defending team state champion Lambert and take home the Class 6A-7A girls swimming and diving team state crown. Walton’s talented lineup of state qualifiers piled up the points in events like the 50-yard freestyle that saw Evan Arsenault, Jasmin Hoffman and Melissa Cox finish second, third and fourth, respectively, for 60 of the Raiders’ 366 total points. Walton’s state-record performance in the 200-yard freestyle relay added 48 points and four Raiders swimmers finished in the top seven of the 100-yard freestyle, including Emma Cole who won the event with a 49.45 finish. The Raiders occupied four of the 10 lanes and compiled 78 points with their depth in the 100-yard freestyle. On the boys’ side, Brookwood successfully defended its Class 6A title, by taking the newly combined Class 6A-7A state crown with a 233.5-point effort. Mill Creek finished a close second with 209 points and Lambert totaled 196 points for third place. 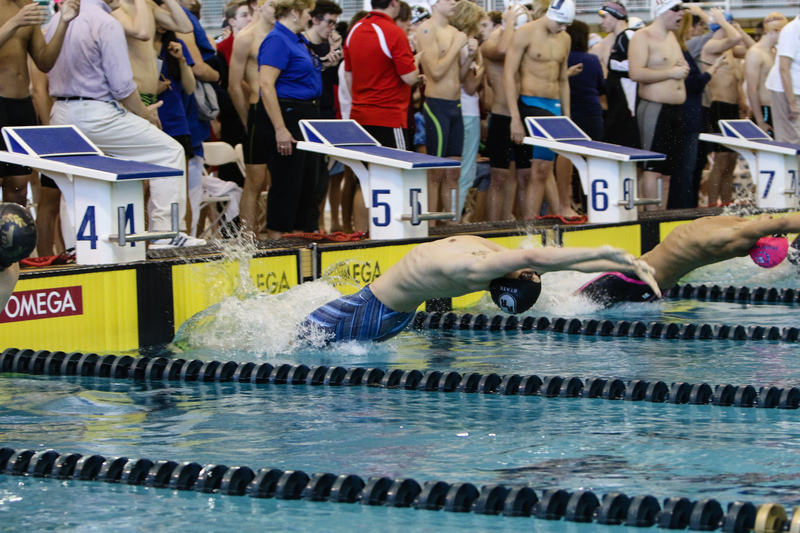 Andrew Huenniger added 21 points with a second-place finish in the 100-yard butterfly and teammate Drew Grier’s tenth-place finish added 13 points in the event. Huenniger clocked a 1:38.40 in the 200-yard freestyle to earn a third-place finish worth 20 points and the team added 34 more points with a sixth-place finish in the 200-yard medley relay. This is the Broncos’ fifth all-time boys swimming state title. The Marist girls used 219 points to edge second-place Chamblee (210) and third-place Starr’s Mill (208.5) in route to a third consecutive Class A-5A team state title. The War Eagles were led by Elizabeth Bailey, who won state in the 200-yard freestyle (1:51.11) and took a second-place finish in the 100-yard butterfly. Starr’s Mill edged Chamblee by less than seven-tenths of a second to take state in the 200-yard freestyle relay, while Marist (1:40.95) added 38 points with a fourth-place finish behind Chamblee (1:40.87). St. Pius outscored two-time defending state champion Westminster 340-to-283 to clinch the boys Class A-5A state title, its first since 2014. Jeffrey Durmer got the Golden Lions off to a fast start with a state title-clinching 1:40.13 finish in the 200-yard freestyle. Durmer also took a first-place finish in the 500-yard freestyle, while teammate Ian Grum placed second (4:31.05) to tally a 45-point event for the state champs.